NLRB finds merit to “Belly Bump” charges against ILWU and PMA. The Rich Austin and Doug Stearns show at the Seattle JPLRC, has earned them another Complaint from the NLRB. On Friday, October 27, 2017, Region 19 found merit to the following charges related to Greg Anthony’s belly bump. Or for those who prefer PDF; NLRB Case 19-CB-204318 Belly Bump charge against Local 19, and NLRB Case 19-CA-204276 Belly Bump charge against PMA. Here is the story about the Belly Bump felt up and down the West Coast. On or about September 6, 2016, Martinez filed a Section 13.3 discrimination complaint against the Local 19 dispatchers for placing names on dispatch slips prior to the start of dispatch, and had a Section 17.4 hearing scheduled by the JPLRC for September 27, 2016. On September 26, 2016, the day before his hearing, Martinez noticed the dispatcher had again placed names on dispatch slips, prior to the start of dispatch, and he asked dispatcher Darren Woeck why they were continuing to place names on the dispatch slips prior to the start of dispatch. Woeck asked if Martinez was recording him, then accused Martinez of threating him, stopped dispatching, and went to talk to the PMA Observer. 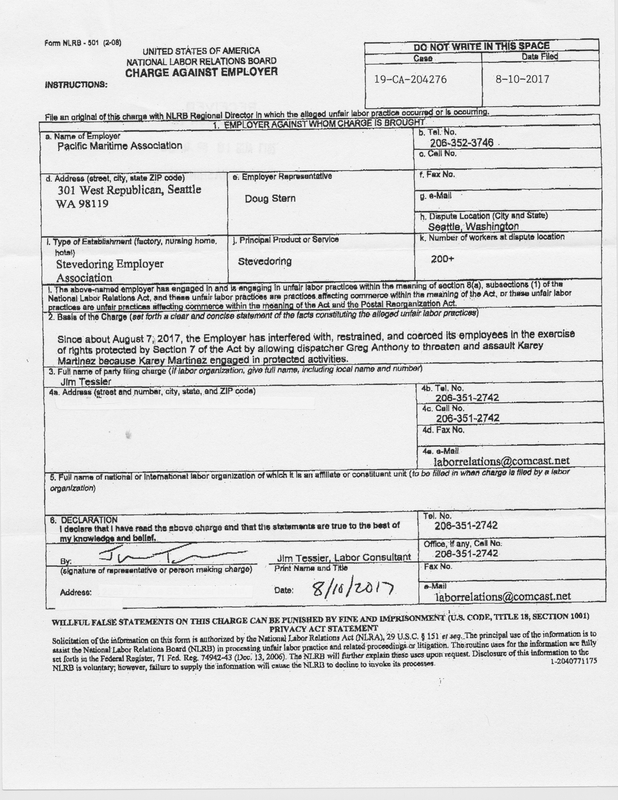 On September 27, 2016, Local 19 President Rich Austin and Doug Stearns from PMA refused to allow Martinez to be represented by Class A longshoreman Eric Aldape at the Section 17.41 hearing regarding his Section 13.3 Complaint against the Local 19 dispatchers for placing names on dispatch slips prior to the start of dispatch. 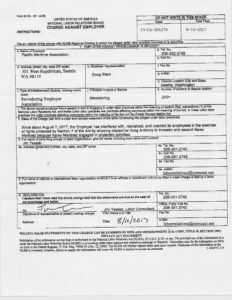 On October 27, 2016, Local 19 provided Martinez a copy of a Union Complaint filed against him by dispatcher Darren Woeck, containing his allegations of what happened during dispatch on September 26, 2016. “According to the plain language of Section 17.81, only the Employers have standing to file a complaint under Section 17.81. Woeck’s grievance against Martinez involves the incident which occurred on September 26, 2017, in the dispatch hall, was reported to the PMA observer at the time it happened, and no Employer Complaint was ever filed. Martinez does not recall any discussion related to the Union Complaint filed by Woeck. On November 28, 2016, Martinez wrote to PMA and asked when he was going to get his Section 13.3 hearing. PMA did not respond. On December 1, 2016, Martinez went to the JPLRC meeting on his own again (without being cited) to discuss his Section 13.3 complaint against the dispatchers for placing names on dispatch slips prior to the start of dispatch, and to get an answer to his request for the 30-day rule for filing complaints in Seattle. Martinez asked when he was going to get an answer to his question related to representation at Section 17.41 hearings, and when the hearing scheduled for November 28, 2017, which he was not notified of in a timely manor, was going to be rescheduled. Martinez did not know the JPLRC was going to process the Union Complaint filed by dispatcher Woeck related to the September 26th incident, as he had received no notice from the JPLRC. Martinez thought Tom’s statement was odd, but he decided to answer and told the JPLRC who his witnesses were and left the meeting. On January 25, 2017, Martinez wrote the Seattle JPLRC and again requested a copy of the 30-day rule, a response to the question of representation at his Section 17.41 hearing, and the rescheduled date for the hearing. The JPLRC did not respond. On January 30, 2017, Martinez filed another Section 13.3 discrimination complaint related to the dispatchers continuing to place names on the dispatch slips prior to the start of dispatch. On February 15, 2017, the Seattle JPLRC wrote to Martinez denying his Section 13.3 discrimination complaint. He was given 3 copies of the same letter, each with a hand written notation indicating which of is complaints was being denied. The letter states his claim is not proper, but does not explain why. 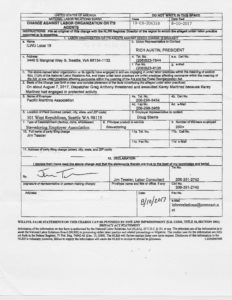 On February 24, 2017, the Seattle JPLRC wrote Martinez a “Letter of Warning,” telling him he was guilty of violating Section 17.125 of the PCLCD. Section 17.125 of the PCLCD spells out the duties of the JPLRC. Martinez cannot be found guilty of violating the duties of the JPLRC. Complaints are filed under Section 17.81, and according to the plain language of Section 17.81, only the Employers have standing to file a complaint under Section 17.81. No Employer Complaint was filed. On February 28, 2017, Martinez appealed the decision of the Seattle JPLRC to deny his Section 13.3 discrimination complaint to the CLRC in accordance with Section 17.42 of the PCLCD. The CLRC has not responded. On July 7, 2017, upon receiving the Region’s decision to dismiss, Martinez became aware that the Union Complaint filed by Woeck had been heard by the JPLRC at the November 2016 meeting and at the December 2017 meeting, and he requested the Minutes from both meetings. The JPLRC Minutes for both the November 2016 and the December 2016 meetings are nearly identical. Both falsely claim that the line jobs that Martinez was complaining about, were 28 day line jobs being offered to individuals on the lines board. Woeck flat out lied to the JPLRC about the jobs in dispute. There are 8 photos of the jobs in dispute and show they are 8 hour lines jobs, for the barge that hauled away the Big Bertha tunnel debris, and 1 photo to show what a 28 day lines order looks like. 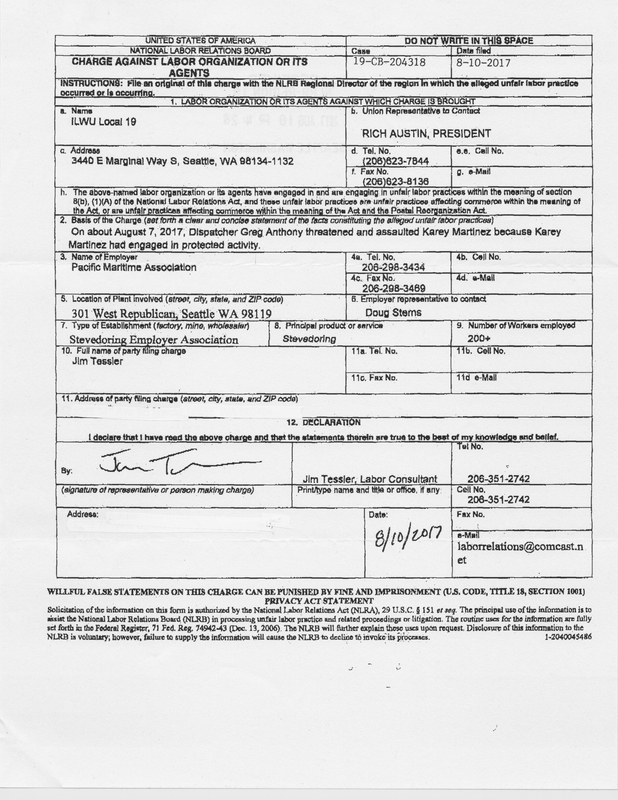 The JPLRC knew what jobs were in dispute because Eric Aldape told them on September 27th at the first Section 17.41 hearing, before it was canceled. The JPLRC knew the jobs in dispute were not normal tie up or let go lines jobs, they flat out lied about that. The JPLRC also flat out lied about citing Martinez’s witnesses, Thomas and Mitchell. The JPLRC claims in the November Minutes that they are going to cite both Thomas and Mitchell, but never did. The JPLRC claims in the December Minutes that Thomas and Mitchell “declined to appear as witnesses.” Individuals cited to appear do not have the option of declining. Thomas and Mitchell did not decline to appear; they were never contacted. On August 7, 2017, Martinez was assaulted by Dispatcher Greg Anthony who belly bumped him across the Dispatch Hall because of a comment Martinez made related to Anthony’s testimony, as reported in the December 2016 JPLRC Minutes, regarding Woeck’s Union Complaint. For those who don’t know, the belly bump is the standard move intended to provoke a response that will allow belly bumper to justify their next move; either a phony Union Complaint or a beat down depending on the person involved. Now Local 19 and PMA will have 2 weeks to decide if they want to settle or have a Complaint issued and go to trial. What do you think they will do?